Eleven giant pyres of tusks were set alight Saturday as Kenya torched its vast ivory stockpile in a grand gesture aimed at shocking the world into stopping the slaughter of elephants. Huge white clouds of smoke spiralled into the sky as the flames took hold, fuelled by thousands of litres of diesel and kerosene injected through steel pipes. 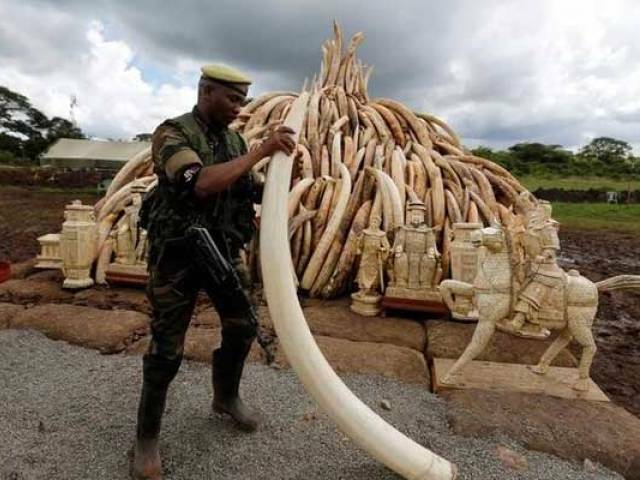 Lighting the fire in Nairobi’s national park, Kenyan President Uhuru Kenyatta demanded a total ban on trade in ivory to end the "murderous" trafficking and prevent the extinction of elephants in the wild. "The height of the pile of ivory before us marks the strength of our resolve," Kenyatta said, before thrusting a burning torch onto the ivory. The bonfires are the largest-ever torching of ivory, containing 105 tonnes from thousands of dead elephants, seven times bigger than any stockpile burned before.